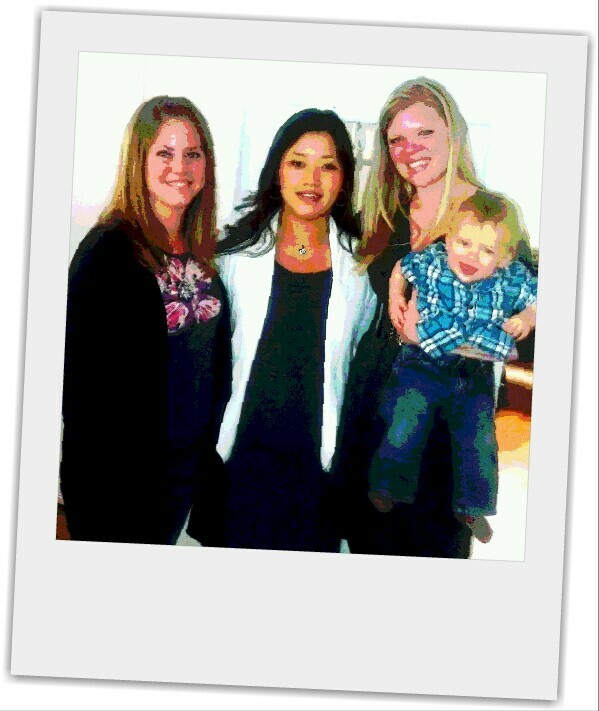 This weekend Sharla, Tayden and I drove down to Des Moines to celebrate with Kristine and Bobby at their baby shower. Unfortunately, it was a quick trip, but it was nice to visit with them and see the enhancements they’ve done to their house. Instead of a traditional baby shower, they had a combined shower with friends and family. If Sharla and I had known, we would have invited the husbands along! As it was, Tayden filled the role as ‘the man’ of our group. To my surprise, he did very well on the trip down and back (considering the distance) and was a ball of giggles at the party itself. 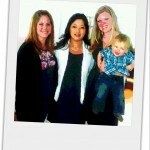 Kristine and Bobby, I hope to see you guys again soon and best of luck with the rest of the pregnancy! Well, things are finally starting to come together. Construction on our basement essentially finished several months ago – we’ve just been dillydallying on the final little touches. Imagine that. We passed all of our inspections, had our final pass through for touch ups and are now moving on to getting things set up. The bathroom is completely put together, we have the guest bed out and ready (anyone wanna come for a visit?? 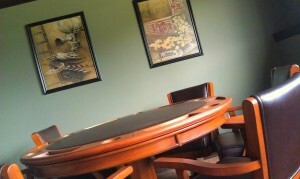 ), we’ve hung quite a few cinema themed pieces in the main area and just had our game table delivered!! Our blinds have been ordered and will be installed in a couple of weeks. I still have some decorating and setting up I am itching to do, but first we really need to focus on getting seating picked out and a projector/screen purchased. Finding furniture is much harder than I remember. One of the most exciting steps yet to come (at least to me) is to have our duct work blown out. We didn’t have it professionally cleaned after the original construction, and given the amount of drywall dust that flew about during the basement finish, I’m looking forward to some air purification! Allergy sufferers count down the days. This morning I had a consultation with a Rheumatologist regarding the joint pain I’m experiencing. After it was all said and done, she noted there was inflammation and I walked away with a diagnosis of “inflammatory arthritis.” There’s nothing like receiving a diagnosis meant for the geriatric population to solidify ones feelings of awesomeness. I follow up with her again in 6 weeks. To help control symptoms in the mean time, she put me back on steroids. Instead of doing the burst and taper pack like before (for quick relief), I am on a consistent low dosage (for constant relief). In 4 weeks I go in for a bunch of tests (labs and x-rays), because she is trying to determine a cause for the inflammation. If it’s viral in nature, I have hope that it’ll eventually subside and I can carry on with my life. If not, I’ll need to determine what that means for me long term. Wee? Today was our nephews first birthday party! He turned 1 toward the end of July, but due to scheduling conflicts on the part of his parents, he had a delayed celebration. 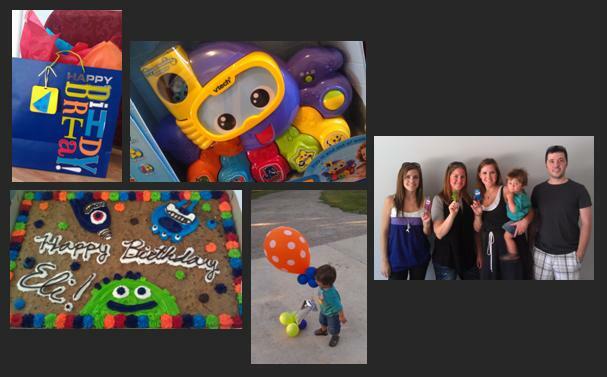 The party had a monster theme, with tons of fun balloons, table covers, themed cookie and finger puppets! Little Eli is so loved; he had a ton of friends and family in attendance. He took in a sizable loot, but his mom and dad have considered donating a chunk of the presents received to the local women and children’s shelter as he is already blessed with an abundance of toys! They are, of course, keeping our gift (a musical, bubble blowing octopus)! !